The morning couldn&apos;t have come any sooner. Somehow El was met at the door by both her parents when she arrived home just as the sun was peaking over the horizon. Her mother was tapping her foot impatiently with a nasty scowl and her father almost looked sympathetic. She had a feeling it had something to do with Paul. After her mother sent her to her room, he was leaning at his doorway with a smirk across his face. It infuriated her to see him so smug. She hadn&apos;t been around for the last nine years and now she comes back and this is how she&apos;s treated. What could she have possibly done to deserve it? It was useless to even dwell on the subject when there was a good chance Paul was being a jerk just because he could be. El could say she was a morning person. She enjoyed being up bright and early and getting a good start on the day, but today it seemed impossible to even think about getting out of bed. Her head felt numb and sore and her body ached all over. Never again am I drinking alcohol, she thought pulling the covers over her head. Despite how the night unfortunately ended she had to admit it&apos;d been worth it. She hadn&apos;t had that much fun in years and that was no exaggeration. Not 5 minutes had gone by when two soft knocks sounded on her door. It was odd seeing as Paul always made it a habit to make as much noise as possible. Lazily her eyes reopened and a sigh left her lips. She pulled the covers down only slightly to uncover her eyes. They squinted under the harsh lighting and she leaned over to pull the curtains to her window shut. The door creaked open and rather than having to deal with Paul so early on an already bad day, she was happy to see Joey&apos;s head stick through the small opening. He was smiling and being quiet as he stepped in carrying a mug. She groaned internally hoping it wasn&apos;t more coffee. It was bitter and gross. How anyone drank it was beyond her. "I know you probably don&apos;t want more caffeine so I had mom brew some green tea. I told her it was for me. The last thing you want is to go down stairs and be hungover." El laughed and sat up in bed welcoming the warmth of the mug as he placed it in her hands. Slowly she brought the mug to lips and carefully tipped it up. The tea soothed her scratchy throat and cooled the burning in her chest. She was too young to have heartburn. She moaned in relief and took another sip of the herbal tea. "I added some lavender for your stomach." Joey commented taking a seat at the foot of her bed. He shrugged. "You&apos;re my little sister, El. There&apos;s nothing I wouldn&apos;t do for you." She didn&apos;t want him to see the tears pricking her eyes as she leaned forward and hugged him tightly. He chuckled, returning the hug just as tightly. El pulled back and he stood, "Get ready for school, I told the parents I&apos;d take you today." "Probably to Paul&apos;s relief." El muttered in return with a roll of her eyes. He scoffed, "He was ecstatic for about five seconds and then he went back to sleep." "I&apos;ll be down in a few." she quipped and he nodded. El began to comb her hair back into a pony tail and use the hair tie around her wrist when something caught Joey&apos;s eye. He stepped forward and touched the skin behind her ear gently. She hissed at the stinging sensation and he quickly pulled back his hand. Joey&apos;s eyebrows raised questioningly, "Did you get a tattoo last night?" 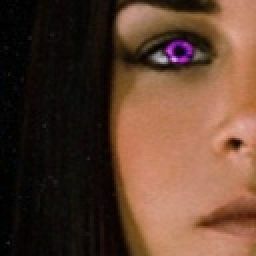 El&apos;s eyes widened as her finger tips gently grazed over the irritated flesh behind her ear. "No, what?!" Tripping over herself she nearly spilled the hot liquid in her mug all over herself before she safely set it on her dresser. She stumbled into the bathroom and leaned in closely to the mirror to inspect her &apos;tattoo&apos;. A gasp caught in her throat at the perfect mark darkly engraved just beside her hairline.